- On Sunday the forecast called for sunny skies with a chance of awesomeness! With such a favorable forecast I headed out to get in a marathon distance hike in one of my favorites spots, the Bonds, with a Zealand chaser! - I was on the trail relatively early, just before 7 a.m. and set out along the old East Branch Railroad grade for five miles before banging a left at the old Camp 16 clearing where I steadily made my way up to the majestic 'Cliffs of Bond' where I was greeted with super huge views! - From Bondcliff to the summit of Mount Bond is just over a mile of some of the greatest hiking in all of the northeast. Mountain ranges can be seen in all directions and except for a tiny view of the top of a few ski trails over at Loon Mountain there is no view of anything man made; no roads, buildings, power lines, houses, etc. - As I headed back into the scrub below Mount Bond the previous tracks had wondered to far to the left so I went to the right and eventually found the trail to avoid nasty spruce traps. I took a break at the summit before motoring my way down and up to Mount Guyot. In my opinion Guyot has views that are even better than the Bonds and even more secluded. From Guyot I followed a faint snowshoe track for a half mile before stumbling into hikers coming my way, yes! It turns out I had exchanged emails with one of the hikers this past winter (Zachary), who has hiked all over the place in New England. After a few minutes I kept heading over to Zealand and ran into Denise and Tim who were hiking with Ed and Bruce. - I made it to Zealand and stopped to eat lunch below the summit sign which was only a few inches above the snow, the summit sign is almost six feet off the ground so there's still plenty of snow above 4,000 feet! After refueling and feeding the Gray Jays I headed back over to Guyot and then over to the West Bond Spur where the trail became a maze through the woods off trail. Luckily, I have been on this trail numerous times and knew I was off course so I wondered through the woods until stumbling upon the trail where I ran into the others again along with Joe, who I hiked with a few weeks back. - On the summit of West Bond I took another break while the others took off. I eventually caught up to them at the West Bond Spur / Bondcliff junction before I parted ways for the day. Below Bondcliff I caught up with Joe and hiked with him for about a mile before I took another break. I wouldn't see him again until the last mile. The hike back to the car was long and slow as the spring snow makes conditions tricky and tiring. Most hikers loathe the last part of the hike along the old railroad bed back to the Lincoln Woods Trailhead. 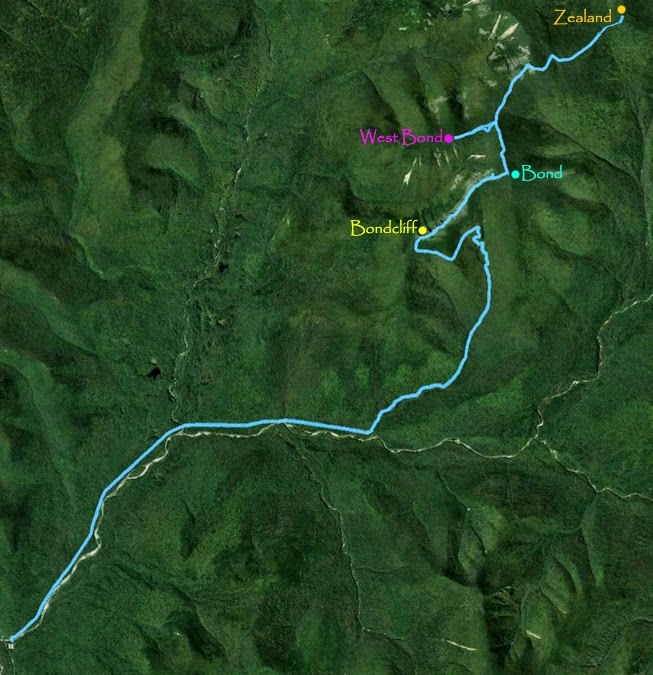 It's a flat five mile trek through the woods that parallels the East Branch of the Pemigewasset River. The first few times along this section I shared the same sentiment but after reading about the history of the railroad and the trails through here I enjoy it a lot and am always looking around for old railroad 'junk' to explore off trail in the woods. It makes the miles go by quicker and more enjoyable. - When I caught up to Joe we both power hiked the last mile back to the car, it was great to have us push each other until crossing the bridge to finish the hike! - I relaxed in the Jeep for a little while before heading back over the Kanc to North Conway as the sunset ending a perfect day on the trails deep in the Pemi Wilderness! The Lincoln Woods Trailhead off the Kanc is pretty quiet in early spring. In a month this parking lot will be a zoo every weekend! Franconia Brook Footbridge. This bridge was built where an old railroad trestle once stood. Across the bridge is where the Pemigewasset Wilderness Boundary. Ok, so this is where the Bondcliff Trail starts, this used to be where the Wilderness Trail began and the end of the Lincoln Woods Trail. Thirty years ago, before and after this sign it was called the Wilderness Trail and not any of the others, got that? Good! Coming up on Camp 16 clearing. This was where the old start of the Bondcliff Trail headed to the left and the Wilderness Trail kept going straight. That part of the Wilderness Trail has been closed down and two bridges further up have been removed by someone who basically spent little time in these woods and just wanted to jazz up her resume. Basically, the bridges were man made structures in a wilderness zone and needed to be removed since no man made structure erected after 1950ish is allowed to stand once it needs repairs. Thanks a lot! First crossing of the Black Brook on the Bondcliff Trail. From the summit of Mount Bond, one can look down to the secluded alpine meadow on the northeaster shoulder. No trail goes anywhere near that spot! The snowpack reveals some cool view spots that usually are not there. About a mile and a half from the parking lot, a nice way to end the day! Spotted along the Kanc. Why hello there! Glad you like the report and pics, thank you! I would say to bring them along, there should still be a decent amount of snow between Bond, West Bond, and Guyot and with the warm temps that snow will be giving way in places and without snowshoes it might become really annoying without them. Have a great overnight at Guyot! Thanks for the response. As it turned out, there was no good option for equipment to deal with the condition of the monorail. I posted a trip report. Will keep my eyes open for you on the trail. Happy hiking! If you ever have anymore questions email me at cdailey@hpearce.com sometimes I forget to check comments left on the blog so I don't respond as quickly as I'd like. Happy Hiking!